The D.C.-raised emcee and producer Amir “Oddisee” Mohamed has found favor with conscious hip-hop audiences by emphasizing morality and substantive content over commercial pretensions, even if his lyrics fall short of greatness. 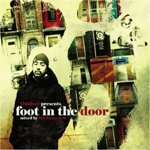 On his latest, Foot in the Door, he covers topics such as minstrelsy in hip-hop, Islam and gentrification. Granted, Oddisee doesn’t always come off as the world’s greatest politician, given that he traffics in sentimentality and often sees things in stark terms of black and white, or good and evil. On a particularly fierce track “Gentrification,” he complains that an influx of Toms and Janes displaced the Leroys in his neighborhood; moreover, he scorns white people for replacing all the old mom-and-pop stores with Starbucks and Ikea, and then doubling the price of a chili dog and fries at Ben’s Chili Bowl. Such clichés probably detract from Oddisee’s skills as a politically-astute lyricist. Still, he shows he can speak intelligently on something other than his wardrobe. Considering that New York’s current rap kingpin only just decided to broach the subject of Hurricane Katrina, Oddisee’s way ahead of the game. Oddisee’s production — which owes its style to mentors Kev Brown and veteran DJ Jazzy Jeff — mostly outpaces his lyrical content, though it’s not aimed for a commercial audience, either. Essentially, this guy does the exact opposite of what anyone trying to make a hit record would do. He includes 34 tracks instead of the requisite 8 or 10. Rather than tap into the familiar hip-hop album formula (which comprises one or two discernible club songs, the requisite fallen comrades song, and the obligatory sensitive guy song, with some filler in between) Oddisee uses smooth beats throughout, often blending the cuts together so seamlessly (thanks to Jazzy Jeff, who “mixed” the songs together like a DJ set) that they sound like one long, sprawling track. Oddisee’s uniform musical style undermines the replay value of Foot in the Door, even if it makes the initial listening experience more pleasurable. But it doesn’t seem like he’s out to make something to turn out a dancefloor or get mad radio play, anyway. He’s trying to accomplish what the Perceptionists did with Black Dialogue: Make an album with a strident political message that’s hooky enough to convert the uninitiated. On that level, he succeeds. This entry was posted in Reviews and tagged Oddisee. Bookmark the permalink.